Start by proofing the yeast. Place the yeast in a small bowl and add the water. The water needs to be about 115 degrees.--.The water will feel very very warm but not hot. When you put your wrist under the tap water it should feel the same temp as your wrist. Got it????? Mix all of the dry ingredients in a large mixing bowl. Stir in the eggs, olive oil, cider vinegar, agave or sugar, and proofed yeast. Roll into 5 equal sized balls and place on a greased cookie sheet (or 4 x-large ones). Slightly flatten with the palm of your hand. 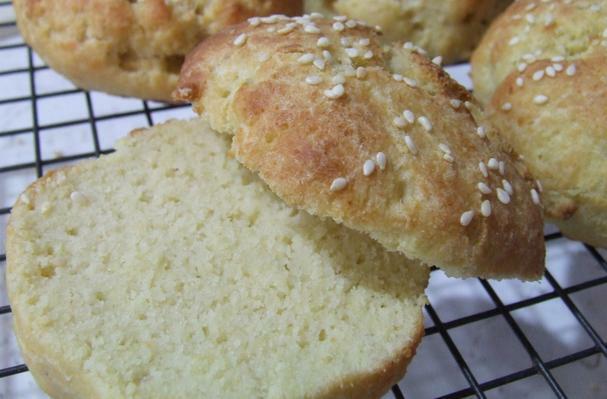 Brush some olive oil over the tops of the buns and sprinkle with sesame seeds. Cover and allow to rise for 25-30 minutes in a warm spot. Hint- I placed a salt shaker in the middle of my cookie sheet before I covered it with a kitchen towel so the towel didn't stick to the buns. Remove kitchen towel and bake 12-15 minutes or until nicely browned. These gluten free hamburger buns aren't gummy or dense and don't fall apart like other gluten free hamburger buns I've tried. No, these has a good crumb, good texture, and are just plain good. Note- Only very finely ground blanched almond flour will work for this recipe, I use the Honeyville brand.